I found this on the list of Apple copyrights. I think Apple had a line of digital cameras named Quicktake. This was a while ago. "Apple sees the camera being used for business, education and "memories". It is fully automatic, with a built-in flash. A window at the rear of the camera is surrounded by four buttons which control the flash, picture resolution, self-timer, and delete functions. The camera can store up to 32 images at a resolution of 320 x 240 pixels - each a quarter of a 13 inch monitor screenful - or eight 640 x 480 pixel images - each a full 13 inch monitor screenful - for up to a year in its internal flash memory. The resolution can be changed on a shot-by-shot basis if required." I have a QuickTake 200. My sister still uses it, but the battery only lasts about 15 minutes. Ahh yes I remember those two. I used both back in the day. They were good for their time. FWIW the 200 was actually just a rebadged Fuji camera. Wow, I never knew this info, APple has been involved with many things like this (Newton, Pippin, etc.) Thanks for the info! Yeah, I used the 150 back in the day. Really low quality (320 x 240) if I remember correctly! And man did that sucker eat batteries. I worked in a textbook illustration house and we would take pics of each other as a reference for situational art. Even with the poor quality, it saved us tons of time. 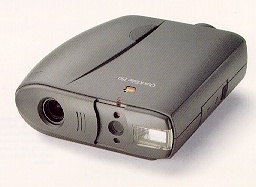 IIRC, the original Apple QuickTake was one of the very first consumer-level digital cameras. It shared the binocular form-factor with its cousin, the Kodak DS DC50. It is my understanding that both cameras were manufactured by Kodak. I hate to ask this as this is strange timing but I have the sad task of having to open and print pictures that were recently taken with a QuickTake 150. Unfortunately these pictures are on a LC630 quadra the is at a country property. I have aquired a copy of the images on a disk that my iMac G5 can read but I can't open the images. Apparently i dont have the Quick Time compressor extensions for classic to enable me to open the pic's. I don't suppose that anyone might no a link to them on the web?. Thanks in advance for any help!. In the dysfunctional early-mid '90s, Apple made all kind of crazy products. Scanners, digital cameras, natural keyboards, external hard drives, external speakers, external CD drives, not to mention a whole line of printers (mostly rebadged Canons and HP's though). Slashing all that was one of steve jobs' first big moves when he came on board. It was kind of cool, though, and i expect some of the more obscure stuff will be collectible at some point. A lot of the stuff had beautiful industrial design. IIRC, you only had a choice of PICT or JPEG on the Quicktakes. PICT files are huge, well over 200K each; JPEG files are about 50K each. If you have Mac OS X, you might try renaming copies of the files to have ".jpeg" on the end and then using "open with -> preview".